Security is a means of preventing dangers or losses. In general, security is similar to safety. The difference between the two is that security cares more than general safety about dangers from the outside. 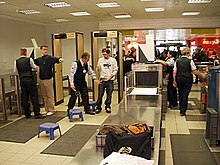 Airports and banks usually have a lot of security measures. Prison security is used mainly to stop prisoners from escaping. It is also used to stop prisoners from harming prison employees or other prisoners. Maximum security is found in or around prisons or other types of places where people need to be kept in or kept out. 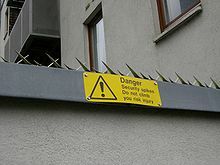 It is the highest security level for a building or area. Operations Security Professional's Association Website http://www.opsecprofessionals.org. This page was last changed on 13 September 2018, at 05:02.